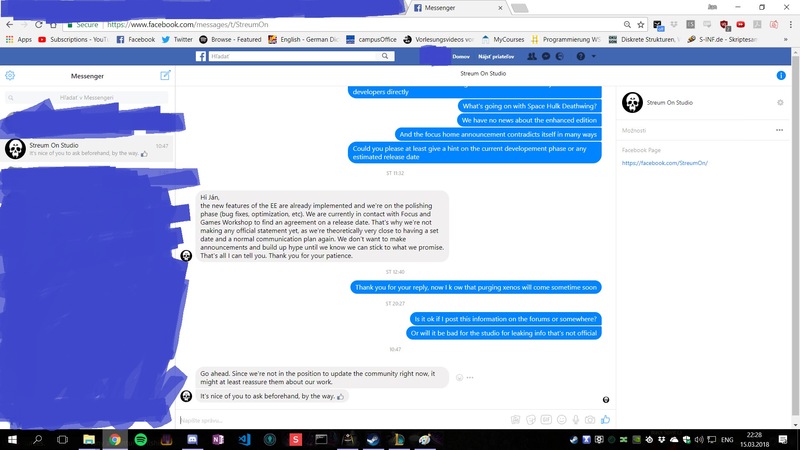 being frustrated with lack of news from Focus Home and no responses to questions, I wondered whether the developer will answer. After contacting them through their facebook page, which only has 141 likes, no one seems to know about it, this is the response I got. the new features of the EE are already implemented and we're on the polishing phase (bug fixes, optimization, etc). We are currently in contact with Focus and Games Workshop to find an agreement on a release date. That's why we're not making any official statement yet, as we're theoretically very close to having a set date and a normal communication plan again. We don't want to make announcements and build up hype until we know we can stick to what we promise. That's all I can tell you. Thank you for your patience. With their approval I'm posting this here. Hopefully there will be an official announcement soon. Some good news and I'm looking forward to finally hearing something official but that it's taken this long hasn't done them any favours, with Vermintide 2 and now Inquisitor; Martyr set for release. I'll undoubtedly be picking it up once again, this time on PS4 but there's stiff competition out there. Here's hoping their hard work pays off. Given how enjoyable Deathwing is I'd like to see Streum get another shot at the 40K IP. As a side note, their page is relatively new and I think (Not entirely sure) their only other game is E.Y.E so it's understandable for them to be somewhat unknown. For now atleast. I've been touting the greatness of Spacehulk; Deathwing for some time now, since I began following it in 2014. The devs (Streum on) are genious and have all my respect, how can't it be when you see this fabulous game they have created?! The publisher (focus) have lot to learn about how to communicate toward their customers but have merit to edit good 40k games. I saw lot of fanboys, but no one as you. frustrating that these updates only come when people go out of their way to get to them. It shouldn't be this hard to stay updated on a game that's effectively on its 3rd year of delays. oh look, everything went exactly is I thought in the first place. Then there's the absolutely massive disinformation campaign by few users pretty much feeding each other assumptions and twisted word truths filled with vile emotion while lacking pretty much facts, structure and clarity. Somehow I see it now if the content here where to be matched by some presidential tweeting the factfactor ( ) % will hit similar numbers. Content by users that is. My inner circle contacts have confirmed that when these individuals come online so does Steve Bannon log on to his computer. "Just so you guys know what's going on behind the scenes, we and Focus Home Interactive conducted a closed Space Hulk Deathwing Enhanced Edition Beta which ended last Thursday, and the resulting feedback has helped us a lot, not only to fix glitches, but also to better balance the difficulty and the effectiveness of weapons. The features and game mechanics of the Enhanced Edition are fully implemented and we are on the polishing phase (bugfixes, optimization, etc). Still a bit of work ahead. Stay tuned." Yea they posted on Twitter, we should be following the dev not Focus Home. Then why not put this kind of info on the Spacehulk Deathwing Enhanced Edition official forum where it belongs! Frankly, I’m not in the mood for relying on trawlers of obscure internet tweets or soothsayers for straightforward answers. @Netheos @Iyagovos do you guys know what's going on? Well claiming that Melanie T. is part of the inner circle is kinda "far" but then you would not know if she truly was a fallen or alpha would you? Emperor protects and in the end the part of the servant is to die for the Emperor or die trying. -CattleBrother Infactus of the Golden Flail. For one I CAN RUN STAR CITIZEN!!!! but Star Citizen works here... hmmmm. At least No Man's Sky worked. And there you have it, Enhanced Edition lands on PC and PS4 on May 22nd. So, for what is the Official Forum of the game? At least one fault it is not yours.